Following in the line of hep/hip and hipster, the term comes into wider use after Michael Fallon's series of stories for the San Francisco Examiner (and later with San Francisco Chronicle columnist Herb Caen's frequent use of the term). 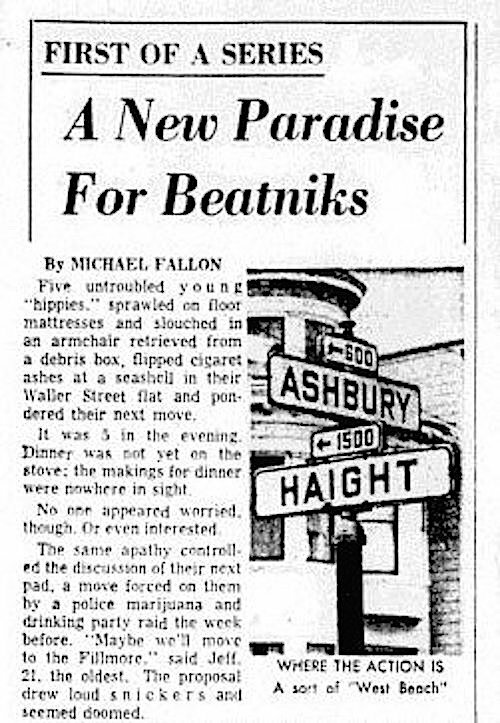 The articles also serve to put San Francisco's Haight-Ashbury district at the center of the counterculture movement. Was there a song in the early 1960s that had the line, 'Where do all the hippies meet? South Street, South Street; where the dancing is elite, South Street, South Street"
You're right. "South Street," from The Orlons in 1963. Thanks--grew up around Philadelphia and just took it for granted it referred to South Street there; didn't have a clue what "hippies" were in 1963.